Hans Wittwer (February 4th 1894 -March 9th 1952) was a Swiss architect from Basel who mainly worked in Germany. He taught at the Bauhaus in Dessau from 1927 to 1929. Hans Wittwer strudied architecture at the ETH Zurich with Friedrich Bluntschli and Karl Moser which he completed in 1916. Thereafter he worked at the architecture practice Karl Moser in Zurich. Wittwer also studied history of urban development at the University of London in 1925. In the same year he joined a group of architects who published the magazine "ABC–Beiträge zum Bauen" (Contributions on Building). 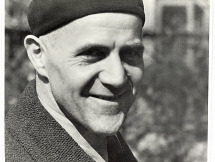 In 1926/27 he founded his own office in Basel which he co-directed with Hannes Meyer. The practice's competition entry for the "Petersschule", a commission for a school building in Basel which was drafted in 1926, but never realised, won the office critical acclaim and ultimately led to Wittwer's appointment to the architecture department of the Bauhaus school in Dessau aside Hannes Meyer who became the institution's director. 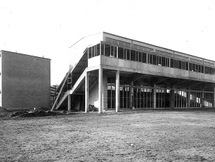 Wittwer began working in Dessau in 1927 as an adjunct teacher for installation theory and technical designing within the Bauhaus' building studies department. From March 1928 to February 1929, he taught building studies and headed the construction office of Hannes Meyer’s building department. At the Bauhaus he introduced new teaching principles with regard to theories of the design process. After his departure from the Bauhaus he moved to the City of Halle where he took up a post at the State-Municipal Applied Arts School of Halle Burg Giebichenstein. There Wittwer was the head of the architecture class and as the artistic director of the studio for interior design. Simultaneously he worked as an architect for the airport Halle. He left his teaching post in 1933, but continued to work as a self-employed architect in Halle until 1934. However he then decided to return to Basel where lived until the end of his life.